The package expires June 30, 2020, with the exception of the Cardinal tickets. NO PURCHASE IS NECESSARY TO ENTER OR WIN. ALL FEDERAL, STATE, LOCAL AND MUNICIPAL LAWS AND REGULATIONS APPLY. VOID WHERE PROHIBITED. Contest entrants will be asked to submit entry form information. 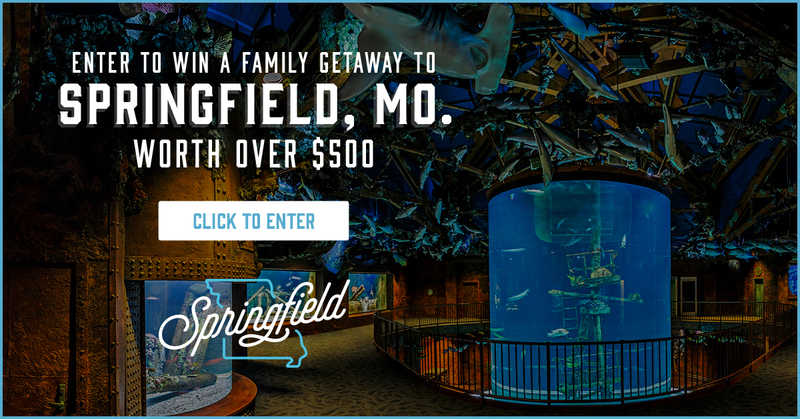 Springfield CVB's Family Getaway giveaway is open to all legal U.S. residents. Employees of Springfield CVB and other companies associated with the promotion of the contest, and their respective parents, subsidiaries, affiliated and advertising and promotion agencies as well as the immediate family (spouse, parents, siblings and children) and household members of each such employee are not eligible. The Contest is subject to federal, state and local laws and regulations. The Contest is promoted by Springfield CVB, located at 815 E. Saint Louis St., Suite 100 Springfield, MO 65806. On or about May 27, 2019, Springfield CVB will randomly select a winner from all eligible entries received during the contest period. The odds of being selected depend on the number of entries received. Sprinfield CVB will attempt to notify the winner via telephone or email on or about May 27, 2019. If the potential winner cannot be contacted within five (5) days after the date of the first attempt to contact him/her, Springfield CVB may select an alternate potential winner in his/her place. By participating in the Contest, entrants agree to release and hold harmless the Sponsor, and each of their respective parents, subsidiaries, affiliates, advertising and promotion agencies, other companies associated with the contest, and each of their respective officers, directors, employees, shareholders, representatives and agents (the Released Parties) from and against any claim or cause of action arising out of participation in the Contest or receipt or use of the prize (including any travel or activity related thereto), including, but not limited to: (a) any technical errors associated with the Contest, including lost, interrupted or unavailable Internet Service Provider (ISP), network, server, wireless service provider, or other connections, availability or accessibility or miscommunications or failed computer, satellite, telephone, cellular tower or cable transmissions, lines, or technical failure or jumbled, scrambled, delayed or misdirected transmissions or computer hardware or software malfunctions, failures or difficulties: (b) unauthorized human intervention in the Contest; (c) mechanical, network, electronic, computer, human, printing or typographical errors; (d) application downloads, any other errors or problems in connection with the Contest, including, without limitation, errors that may occur in the administration of the Contest, the announcement of the winner, the cancellation or postponement of the event and/or the flyover, if applicable, the incorrect downloading of the application, the processing of entries application downloads or in any Contest-related materials; or (f) injury, death, losses or damages of any kind, to person or property which may be caused, directly or indirectly in whole or in part, from entrants participation in the Contest or acceptance, receipt or misuse of the prize (including any travel or activity related thereto). Entrant further agrees that in any cause of action, the Released Parties liability will be limited to the cost of entering and participating in the Contest, and in no event shall the entrant be entitled to receive attorney’s fees. Released Parties are also not responsible for any incorrect or inaccurate information, whether caused by site users, tampering, hacking or by an equipment or programming associated with or utilized in the Contest. Entrant waives the right to claim any damages whatsoever, including, but not limited to punitive, consequential, direct or indirect damages.